Vancouver, Toronto, Edmonton, Regina and Halifax Public Libraries recently presented a session at the Canadian Library Association Conference titled Approaches to Community-Led Work: Library Systems From Across Canada. Presenters from each library system discussed both the successes each system has had with this approach, and how they have/or currently are addressing challenges as they arise. The panellists discussed community-led approaches as additional skills which do not necessarily replace traditional approaches, but provide library staff with the opportunity to build additional skills which can be used when working with community (I believe a key role for public libraries). In addition, community-led library service planning is an approach which can be used with all community members. This is an inclusionary, not an exclusionary approach to developing services with and within community. It was quite striking to see that although each library system has begun to adapt the approach to fit their specific context (communities and library systems), there are commonalities in many of the challenges that library systems face. Staff are very comfortable with their current approaches to library work. Learning new approaches to work can be an intensive undertaking. Developing an understanding of community-led work takes time and dedication. This is not a prescriptive approach to library work, and approaches to working with each community will vary. This initial sense of ambiguity is actually the major benefit to working with community from a community-led perspective. By not standardizing approaches to work and library service development, with communities, the needs of communities drive the development of services. This is why community-led approaches work well for communities. Library staff need to have the opportunity to learn about the approach. If they are not willing to spend time to learn the approach (through reading, ‘doing it through trial and error’, modeling behaviour, changing job descriptions/performance appraisals etc. ), they will continue to oppose the approach. When staff are opposed to the approach, it will be important to clarify their understanding of the approach. Time needs to be provided to allow for transition with community members – to introduce them to the new library staff member. Personally, the social service comment may be the most common interpretations of community led services we receive. As I mentioned before, this is an inclusive approach – and this inclusivity means that library staff will be actively engaging with underserved populations (people who do not traditionally use library services). Since they for the most part do not use library services, but have information needs, it is important for library staff to travel outside of the physical branches to begin building relationships with community members. Public Libraries as public institutions have a role to work with all community members and tax payers, not just those we are traditionally comfortable serving, within a ‘comfortable setting’. This work is completed in an information context, and does not replicate the work of social workers. I am going to generalize, but Library staff have been known to be perfectionists. So what happens when working with community is more complex than either ‘success’ or ‘failure’. All of a sudden traditional output measures, such as counting people in attendance, are no longer the measures which effectively measure success or failure. As library systems across Canada/UK etc. work with this approach it will be important to share best practices and newly developed tools which effectively measure impacts. These are just a few items which will need to be addressed, as library systems grapple with how to ensure that program and service identification, development and delivery shift from library staff perceptions to reflect real community need. As managers within library systems, we have the opportunity to be involved in the development of strategic objectives – and hence – the actions needed by staff to complete these objectives. Service planning is an important part of this process. As you have probably read from previous postings (e.g. see posting) there are various techniques which can be applied ‘on the ground’ to actively engage with community – in order to ensure that the services developed by public libraries truly reflect the needs of community, and not just staff perception of community based information needs. So, how can a library system involve community in the development of regional plans? This is a good question, and there is no ‘one’ answer, since each library system will develop plans differently. However, there are some steps which will be important to consider if you want to ensure your library system is developing programs and services with community. Determine which community you are writing a service plan for (e.g., Immigrants, Older Adults, People with Varying abilities, Teens etc.). You can’t write an effective service plan for the entire community. Analyze – Analyze what you/staff are hearing from the community and go back to the targeted community and verify… is what we are hearing correct? Start exploring or at a minimum, thinking about potential service responses. If a library system is going to work closely with a targeted community, it is essential that library staff are given the opportunity to know about the targeted community (what has been learned to this point from relationships which have been built) and community led approaches. If branch or public service staff who will be working with the community are not provided with upfront training, it highly increases the danger of failure. Build in mechanisms which allow for community involvement in impacting the development of program and service responses either across the system or in a specific community/library branch. Many times a change in one branch can be expanded to have a regional impact. If the change only occurs in one branch, community members will be disappointed if they visit another branch which has not implemented the change…. I am sure there are more steps to this process.. at this point in the morning.. and off the top of my head, this is a great start for library systems. I hope this posting made sense?? P.S. This can also be applied in university library settings – where I would say librarians need to step up and assist universities in justifying the relevance of university education, not just to students and faculty, but to the greater community which subsidies these institutions. The earlier we start doing this, and the more relevant universities are to their local communities, the more public taxpayer support they will receive!! Finally… two new publications in Public Libraries on Community Led work. Well, actually one new publication, and one old publication republished for an American audience. Community-Led Service Planning – Take it or Leave it? Remember George Bush? That guy really had some great quotes didn’t he? One of my favourite is “you’re either with us, or your with the terrorists”. As we have come to understand since 2001 (although some of us saw it immediately after he said it), the danger with dichotomizing complex issues is – presenting people with only two options for viewing the world doesn’t accurately reflect reality. The world is much more complex than x or y.. So what does this have to do with community-led service planning…??? Take it or leave it? Don’t throw the baby out with the bathwater! When thinking about the community-led service model (paired down version below / full version on pp 30-31 of the Working Together Toolkit) it is not an all or none approach to service planning. If the community-led approach is viewed as a standalone approach it can be both overwhelming and scary for library staff, since in order to implement library service planning solely from this perspective, new skills need to be developed by staff. Instead of viewing community led planning as the only way in which to work with community, IT COULD BE VIEWED as a set of additional skills which library staff can develop, and build on top of traditional approaches, in order to improve library services! In addition, library staff can draw upon these new skills, as they or the community see fit. Step I. So, for instance, when determining which community(s) to work with (doing the community assessment) library staff will still want to approach community assessment from a traditional perspective. It will be important to know demographic characteristics of community, who is using your library (internally generated statistics), what current library users think of library services (comment cards, survey results etc.). During this initial phase of community led service planning, it will be imperative to create relationships with the community you want to target (so you will need to, as mentioned in the toolkit, spend time in community (or in branch) developing relationships and discovering what is important to community). If relationships aren’t developed – community led service planning will not occur. Step II. During the next phase of service planning – needs identification – staff can still speculate what community needs are, but after developing relationships, you have the opportunity to verify if library staff perceptions actually match communities perceptions of need. This is a very important step to be aware of.. and can really inform us of the impact of working with communities (especially since we will rarely if ever be able to predict what others needs are without actually consulting or collaborating with them). Now evaluation is a different cup of tea… see a previous blog posting on community led evaluation vs. traditional..
By approaching community led work as a way to both develop new skills to work with community, on top of what we are already doing in libraries, and to discover and develop services based on community needs, it is much more likely to be integrated into a system and receive buy in from staff. In addition, it will also ensure that library staff do not feel like their current approach to work is devalued.. and they will also be much more likely to try innovative new approaches to working with communities. 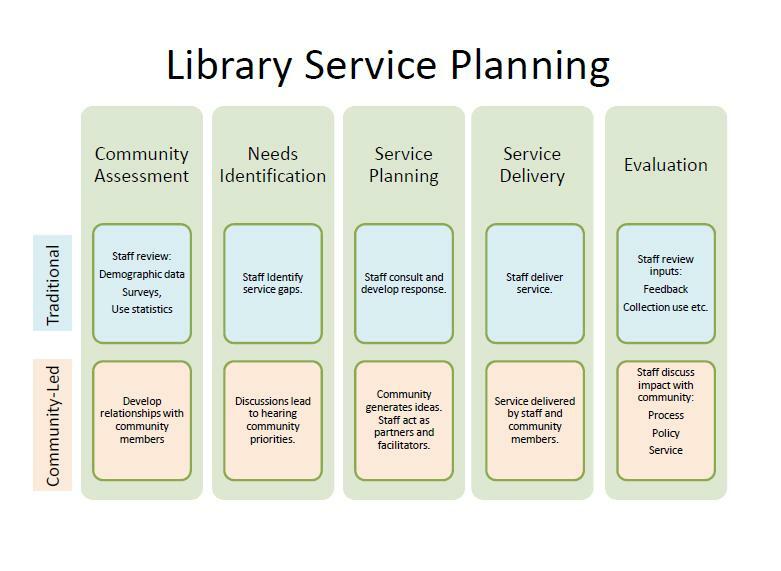 Community led service planning is a relatively new perspective and way of doing library work. Like all new approaches to work, the newness implies and necessitates change. Like all change processes, questions linger about the impact of the change on work. A Community Led approach to library work really isn’t that radical. One perspective, is that it can be viewed as additional skill sets which can be drawn upon when developing and delivering programs and services, where the community (the people we are meant to serve) are engaged in the process (inside and outside the library) – thus making sure what libraries do is relevant to the community. A number of possible rationales can be put forward for not using a community led approach in libraries. Each of these concerns are legitimate, and need to be addressed either by the system, a branch or a service area – when there is a desire to truly include the community in service development. At this point I have identified three broad thematic issues which could be raised to impede the implementing this approach. They include 1. Resources, 2. The Role of Library Services, and 3. The Unknown. Everything we do in libraries takes time and money. When thinking about the potential cost of implementing the approach, also re-evaluate where time and money is currently being spent. A serious evaluation of current activities should at a minimum allow a library system or branch to re-allocate (within the current budget) a portion of current staff time and money towards working with the community. Time is always in short supply. If a gap is identified, it is always easy to fill it with another activity. The question becomes, is it filled with an activity libraries identify internally, or activities that are identified with the community as a priority/need. If the community is involved from the beginning of the service process, time may actually be saved – since relevance to community is ensured. Working with the community, especially the public, in public libraries is part of our mandate. If it is not, be an advocate for changing your library systems mandate/vision/goals etc. As a former social worker and now a librarian, I agree librarians are not social workers. We are information specialists. As information specialists it is our obligation to inform and educate ourselves before making statements like this. The definition of a social worker can be found here and community led librarianship is explained here. That is great. Since the approach was developed in 2008, it would be great to learn from one another. Let’s collaboratively share and discuss best practices – a new site has been launched to do that. Please join here! Great. This approach will ensure that the library system will serve current users even better. For example, by building evaluation into each component of the service planning process, the community will inform the system if something is relevant to them before the program or service is launched. Four major urban library systems across Canada used this approach extensively from 2004-2008, and the approach is being integrated by different systems in different ways. This process was constantly externally evaluated and won national recognition and awards. It has since been adopted and applied in other library systems and many other systems have expressed an interest in learning about the approach. The only way to know if something does or does not work is by trying it. When approaching a community and learning to listen to hear community identified need – the unknown is the most important part of the process. This is where learning and innovation occurs. This is not a repetitive task orientated approach to work. As discussed by Ken Roberts from Hamilton Public Libraries, one of the future trends of library work is moving towards service not task orientated work. This approach will lead to innovation – which in the current environment of rapid changes to the publishing and information management field, can only be beneficial to public libraries. How will it impact my work? I am unsure? The good thing about community led work is that it is a two way process. Library staff, along with the community will be involved in these decisions. Library staff can become more empowered by participating in this change management process. Thanks to John Pateman for feedback on this posting. There are some things that most of us would agree – to standardize seems to make sense or be in our best interest, or, the public’s best interest. For example, no doubt, a lot of us would agree that a standardized minimum wage can be a good thing. And, of course, there are lots of safety standards that make a lot of sense. However, I think we can get caught up in believing that to standardize provides the best public service where libraries are concerned. Or, better put, I think we need to be careful in the application of standardization with community led library services – especially since the needs of various communities (both geographical communities and communities of interest – e.g. web 2.0 users, youth, immigrants, etc.) vary so greatly. “Models” across the board, do not always address specific concerns of diverse communities. For instance, “Pilots” do not always work the same in every different community, or, neighbourhood. What makes sense at one point in time or place, may not at another. Each community is different. From a community led perspective, it may be important to create standardized processes, which provide a set of guidelines on how to implement community led techniques (e.g. asset mapping, community entry, etc.). However, even these standardized guidelines, allow for a certain level of variability or adaptation, in order to allow for the flexibility need to work with communities. There application should not be a standardized linear (predetermined) process. If it is predetermined, it is not community led. Even our own individual interpretations of policies, and, guidelines may differ – causing variations in a standard. I think we need to be more comfortable working with flexibility – and support each other when we make decisions outside of the “standard.” This is how and when innovative new practices/services/programs can be identified, created, and evaluated. So, rather than be annoyed when another person makes a decision against the norm, we need to try and understand why the decision was made and how that might affect us in the future. I think we get too caught up with equating standards with “fairness” and equality. I think we need to put that idea aside, and start applying equity. Standardized guidelines are great to have in place for the times when you need them but I do think we need to be flexible in their application. Special thanks to others for input on this blog posting~! Ensuring library services are meeting the needs of community members is an essential requirement for library services. By being accountable to our local communities, we ensure that within our restricted budgets, programs and services are continuously evaluated and adjusted to meet the changing needs of community. Therefore, based on evaluation – we must be open to the challenges of shifting how we identify, plan, develop and implement library services. I agree with John Pateman that libraries have entered a Pandora’s box, by solely relying on statistics to justify our existence – “The minute that we started to count everything and quantify what we do – from book issues to fines income – we created a huge stick with which others can beat us… the real story is not that book issues have gone down from X to Y, but that MILLIONS of books are still borrowed from libraries every year” (CILIP Update September 2010). In theory, as John further discusses in his article, libraries in and of themselves are public good, and this fact should be justification enough for continued support of public libraries. However, as we can see from the U.S. case, the library as a publicly supported institution, can come under attack. One of the first sectors to come under attack during the recent financial sector created ‘financial crisis’ is the public sector (ranging from teachers and educators, to firefighters and police officers, to libraries – link for Illinois example). As discussed by Naomi Klein in her timely book Shock Doctrine, Milton Friedman and the Chicago Schoolers’ are prepared to take advantage of public confusion during times of economic crisis. So What Should We Learn From this and How to Respond? While libraries are public goods, we need to be able to be prepared to make this justification.. and there is no time like the present!! So, how should we proceed? I am not advocating for replacing current measurement tools used by libraries. Many of the indicators which we are using are very powerful and meaningful output measures. These measures, which are primarily frequency level quantitative measures (which are difficult for using in multivariate – causal based analysis), provide a measuring stick for usage of library programs, materials and other services. They measure concepts such as circulation statistics, gate counts, program attendance, and other quantifiable items. Funders and the public have been taught to expect these measures, and will continue to demand them. As described in the toolkit (see chart below), evaluation measures should continue to include these measures. However, in order to display the impacts that library services are having on community, libraries need to capture and frequently report the narrative (qualitative) impacts. 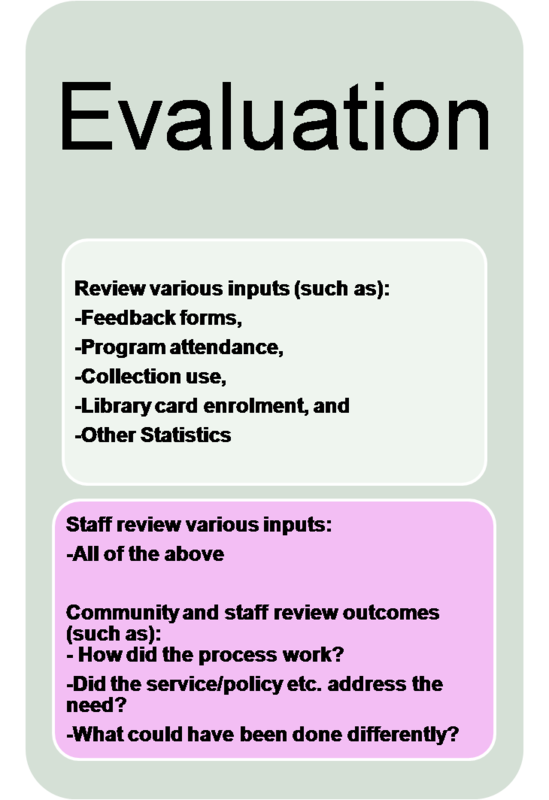 The advantage of doing this is that this form of evaluation ‘picks up’ on the nuances of the social and human component of library services. For example, if 70 people attend a library program and if this number is used as the performance indicator – the number does not provide information on the impacts and outcomes of the interaction between library staff and members of the public, or between community members. These interactions, impacts, and outcomes are already occurring – where library staff are involved in the delivery of services (either within the walls of the library or out in the community). What is needed, are effective mechanisms for library staff to capture and communicate effectively, from the voice of community, the relevancy of library services in meeting community identified need. At a minimum, this information will allow for improved service development and increased justification for continued public support for the social good public libraries facilitate within the community. In addition, it will provide us with the information to show the relevancy of our services to our local communities. A great resource which discusses how to measure the impact of library services is Evaluating the Impact of Your Library. So as library systems how are we doing? A quick measure of success to determine how well we are collecting honest community evaluation is to think about the pace of innovative new practices being implemented within library systems. If we are doing a good job of collecting this information, collaborative community based evaluation, should lead to service changes based on community identified need.